Following our #DAI #Hello my name is blog series for World Alzheimer’s Month #WAM2018, we are continuing with our stories, as we have many more than 30 to share with you. September was an exceptional month for our members, some whom for the first ime, had been given a voice through these blogs. Therefore, today, we feature DAI board member and secretary, Eileen Taylor from Australia. Eileen also co hosts the Monday Australian support group. She and her husband Dubhglas are also co founder of a local advocacy group in Brisbane, the Dementia Advocacy and Awareness Team (DAADT) . Thanks Eileen for sharing your story and for all you do for everyone with dementia. Hello, my name is Eileen Taylor. I was diagnosed with Familial Younger Onset Alzheimer in 2009 aged 59. I was the same age my Dad when he was diagnosed with dementia back in the 1980’s. Both he and his brother in the UK died with a diagnosis of Alzheimer’s in 1994. Back then, Alzheimer’s wasn’t really discussed, and we didn’t know how to recognise the signs. My Dad struggled to focus and sometimes couldn’t remember what happened the day before. His doctor just put this down to being eccentric and told us there was nothing to really worry about. Throughout his long and distressing struggle with dementia, my Dad regretfully was never told the truth about his illness. While I am now trying to live well with dementia, it was very different when I was first diagnosed in 2009. Then, I noticed I was becoming a little forgetful, but it was nothing too major. I didn’t really take too much notice until one day I saw a documentary on TV about the genetic link to dementia. Because of what had happened to my Dad, I thought that I needed to know, so I had a genetic test to find out the truth. Not just for myself, but for my two sons and my grandkids too – I thought they had right to know if the gene was in our family. At first the doctor didn’t think there was any reason to know, after all I was below the age when most people start to show symptoms. But I pushed for it, and I’m glad I did, because it enabled me to catch it early and to be a part of several clinical trials to find answers. Nevertheless, after my diagnosis, I chose to engage in, not give in, but to fight for a cure and to support other people as well as their families living with dementia. I was determined not to remain silent (as what had happened with my Dad) but to speak out and talk to people and help them to understand what it is like to live with dementia. 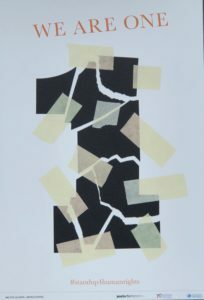 Parallel to the trials, the Dementia Alliance International (DAI) became my lifeline, an oasis in a sea of medical denial and indifference I had seen from some health professionals. It gave me a voice to speak out and I was accepted unconditionally into the group I joined. Now, thankfully, I am a part of the DAI Board, serving as their Secretary, Advocate and on-line support group facilitator for the Australian and New Zealand people. 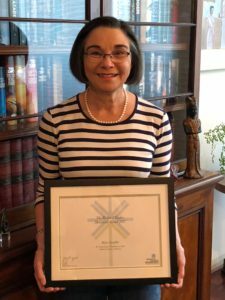 I am also an advocate and co-founder with the Dementia Awareness Advocacy Team (DAAT), as well as an advocate and active participant with Dementia Australia (DA) and serve on several dementia committees. Doug, my husband has supported and helped me to live positively with my dementia by externalizing it. I am not the problem, the problem is the problem, and in my case it’s Alzheimer’s dementia. My dementia externalized is; my “Dark Cloud!” It helps me come to terms, that I am not my Dementia, my Dementia is my Dementia, I am still Eileen. Help us support people such as Eileen. Become a DAI Sponsor or Associate today. On World Alzheimer’s Day, we usually announce the winner of the Richard Taylor Memorial Advocates Award. However this year, we surprised the winner!!! 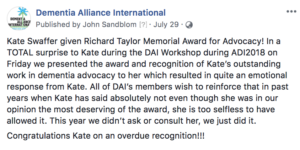 “We have never been prouder than to award DAI’s coveted and prestigious 2018 Richard Taylor Memorial Advocates Award, to our very own and most deserving, Kate Swaffer. 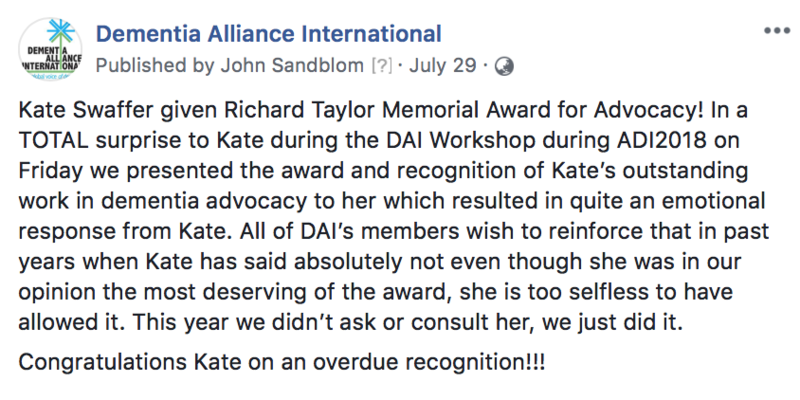 The award was presented to Kate at the DAI Workshop during the 33rdADI Conference in Chicago on July 28th. It was done, without her knowledge, as in past years, she has not allowed the nominations for her to be considered, allowing other DAI members to be recognised for their work, so we decided to make a decision without her knowledge, and surprise her at the conference! Thank You and CONGRATULATIONS Kate. You are the most steadfast, determined, generous, selfless, loving and truly inspirational leader, we have ever known. We also wish to extend a very special thank you to your husband Peter and her son’s Charles & Matthew for sharing you with us and for supporting you in every way so that you could miraculously keep paddling through all the adversity we face on our very important and lifesaving mission. Kate has always refused this award when nominated for it over years past, always nominating someone else to receive it out of concern for “appearing self-serving”. We all knew she would do it again so, we snuck around her, taking it into our own hands. Keeping a secret from Kate as you can imagine, was no easy task but, thanks to our “Big Tuna” (Peter Watt aka BUB) and, a “top-secret board meeting”, we pulled it off without a hitch and with no less than a standing ovation. I dare say, there were many tears of joy in the room that day including, from our dear Kate. 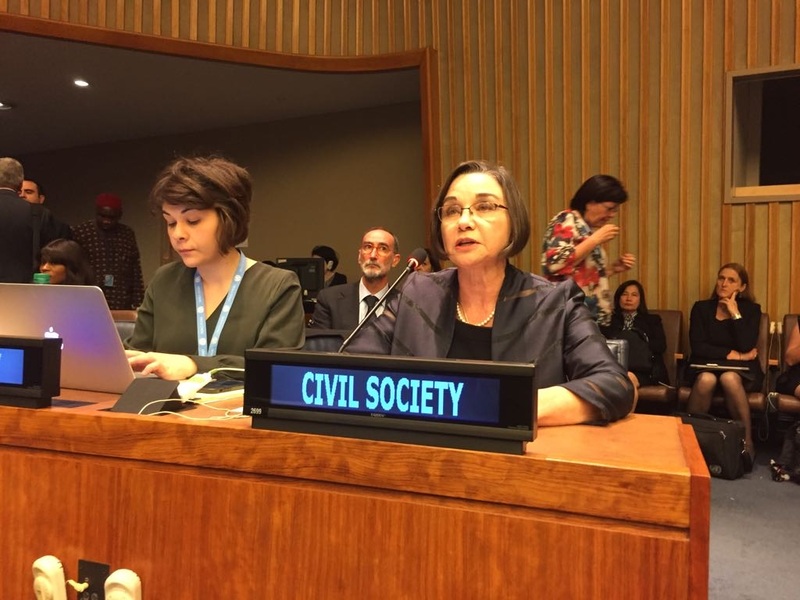 Having been diagnosed at the young age of 49, Kate quickly began her nearly 11-year journey of advocacy that is arguably second to none in terms of achievements. 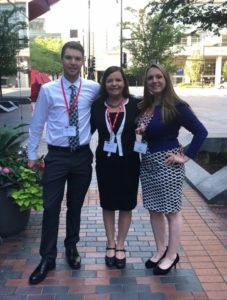 Kate’s unyielding resolve, attention to detail and, tireless work ethic allows her to get things done and, sets her far apart from her peers in the spectrum of Association CEO’s and, other Dementia Advocates. Additionally, Kate’s intelligence, knowledge, grace, force when necessary and calm with which she presents, has made her one of the most sought-after speakers in our world of dementia advocacy, as well as in academic circles. 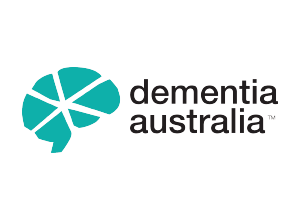 Just four and a half years ago, Kate Swaffer, Richard Taylor, John Sandblom and five others started Dementia Alliance International as a base from which to advocate for people living with Dementia. One might say “they didn’t have a pot to pee in or, a window to throw it out of” but that did not hinder their efforts in the slightest. Their goals were and still are to eradicate stigma, improve education at every level of the care sector, spread public knowledge about dementia, have a voice at Conferences worldwide and, become a part of high level meetings both nationally and internationally. Another very important goal was to create positive change to the lived experience of its members who are living with Dementia, through peer to peer support. The results are nothing short of phenomenal considering the many obstacles we face daily, none the least of which are, we all have dementia, regularly loosing members to death or care homes, in addition to, having inadequate outside financial support. Kate is involved globally in human rights activism, and empowering others with dementia to live positively. 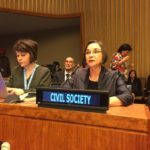 Her publication in The Australian Journal of Dementia Care (2018),“Human rights, disability and dementia”, responds to the WHO Global Plan of Action on the Public Health Response to Dementia 2017-2025. Kate, Richard Taylor is most assuredly smiling down on you and, is incredibly proud of you. 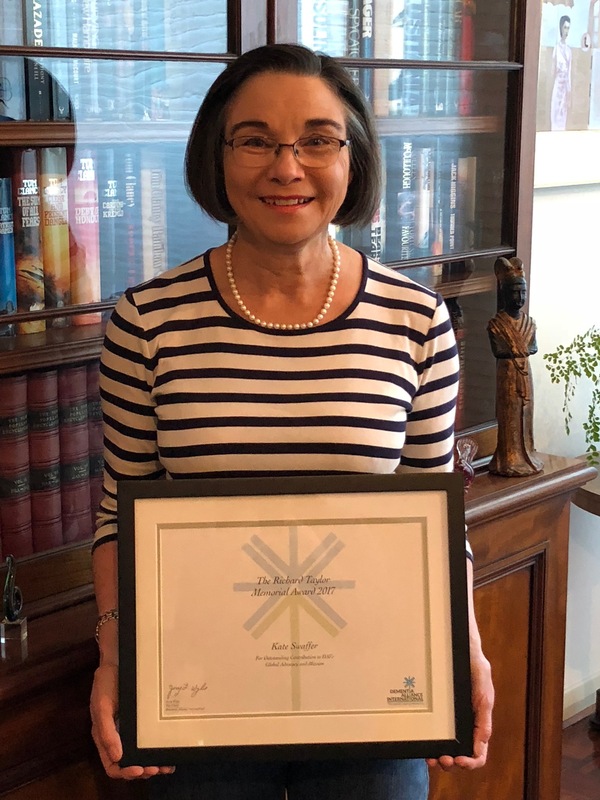 Although Kate received this award at the ADI Conference in Chicago late July, this has been published today because it is World Alzheimer’s Day, the day the DAI announcement is usually made and celebrated. After hearing Kate speak for the first time at a convention in Chicago, a man in his late 20s in a dark suit asked if he could speak to me knowing that I knew and worked with Kate. He was clearly moved by Kate’s message, but more shaken than inspired at first. He started, “Wow – she really hates doctors!” I assumed he was one as well, so I added with narrowed eyes and a sly smile, “Yes, especially the younger ones. May I introduce you?” His eyes got big and from the surprised look that came over his face, “OH! No, I’M not a doctor!” so I asked his interest in the matter. He named the middle-eastern country he was from and said his gran had had some form of dementia for some time now, but it was handled very differently in his culture. He said that she was surrounded and sheltered by so many layers of immediate family members that all here daily needs are met and she is happy. I told him I have 9 cousins, most of whom I haven’t laid eyes on regularly since the Vietnam era. He laughed and said he had over 200 that he knew of. I cautioned him not to quickly judge how our Kate Swaffer, or how the myriad of the world’s cultures from which dementia emerges addresses major cognitive disorders without taking off one’s own myopic spectacles of limited cultural understanding. No coherent progress in theoretical and experimental science into understanding dementia can legitimately proceed without the primary data sources necessary to inform the questions that will generate research that will most efficiently lead us to a world that manages dementia as it does other diseases: benefits and risks. Our primary data sources are the voices and linguistic clues into a person’s changing cognition from those people in early stages of dementia. Kate Swaffer with her own powerful, tireless and simple message of “Let US speak for ourselves” has brought a 21st Century “salon” of penetrating inquiry into dementia to our community centers, doctor’s offices and conference tables – and online to the homes of those with dementia. Kate and other DAI members have helped us to re-discover ourselves, even discover our new voices, advocating to be a central part of a dialog of inclusiveness in the process of research and true change. (David L. Paulson, Ph.D., DAI member). 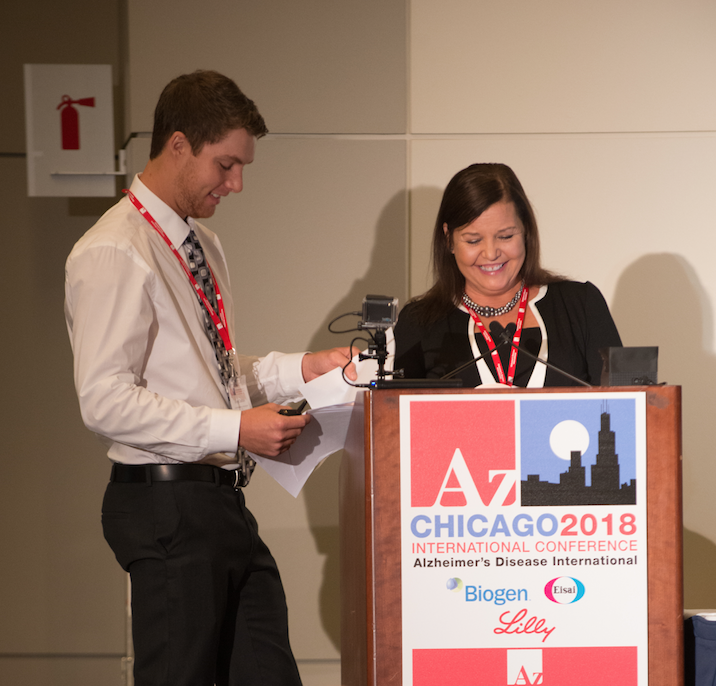 DAI Board member and co host of many peer to peer support groups Maria Turner, diagnosed with younger onset dementia aged 48, presented today with her son Rhys Dalton at the ADI Conference in Chicago. 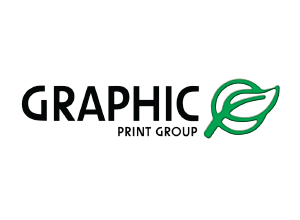 We have many blogs to share, so watch this space… so far, we simply have not had the time! Congratulations to them both for a truly courageous and candid presentation from a young career woman and her 25 year old son, who along with his fiance Kayla, they are both now her primary care partners. Their speech notes are below, and we will add their ppt slides when we upload the video. Hi! I am Maria Turner and I am so privileged and honored to be here today with my son Rhys! The key messages today are about the impact of receiving a diagnosis of younger onset dementia at the age of 48, and how this has impacted on my son and his fiancé. First, I must say that public speaking terrifies me! I’d be happy to try sky-diving, but put me in front of people, I literally just freeze, so please bear with me. I am also here today because of two things. Like so many others, I went to Dr Google, and I found Kate Swaffer and DAI, and then through attending an AFTD conference, my precious friendship with the late Susan Suchan. Susan was one of the very first people I met in person at a conference, just a month after my diagnosis. It was her zest for life, not just a passion, but a deep intense burning for all things good for all. Her attitude & love for life will stay with me forever, and the responsibility she passed on to myself and others in some of our last conversations together. A little about me – I retired from my work as a registered nurse after 30 years. I have spent my life taking care of others, mostly in a critical care environment, and I am determined to not let my diagnosis change that. 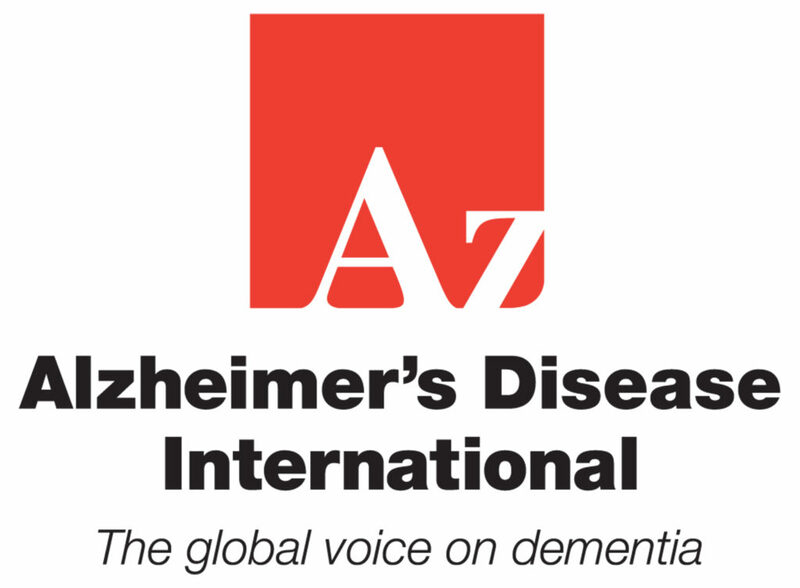 I have always been passionate about volunteering ever since I was 8 years old, and am still actively volunteering for the American Red Cross and as a very active board member for Dementia Alliance International. Although I was diagnosed with FTD in 2016 at the age of 48 and with ALS shortly thereafter, I do live a full and positive life. I host weekly peer-to-peer support groups all over the world for DAI, and I am determined to help those who currently may not have as many resources as those of us who are attending this conference this week. DAI and I want to see a stronger and more inclusive community by reaching out to those who are recently diagnosed so that we can emphasize the fact that we must plan for and be excited about our own futures even after a diagnosis. If I can just walk alongside one person and prevent them from having to walk this path alone, I will know that I had a part in breaking down barriers and helping end the stigma a dementia diagnosis can and will bring. I am here today with my son, Rhys Dalton, and we are going to talk to you about the challenges… and the rewards… of having a parent-child caregiver relationship and about the profound impact that Dementia Alliance International has had on all of our lives. I am also here today because this is not only my story or Rhys’s story. I want everyone to use our story to improve not just the outcomes for the future of people with dementia, but also improve their quality of life today. When Rhys came home to the U.S. after college in the U.K., it was a complete shock to him, although he quickly analyzed the situation and began to figure out his role in supporting me. We soon came to realize that it is really important to find a life outside of dementia. Rhys, Kayla and I are now “roommates”. We get along the way roommates do…not always in agreement, but always respectful of each other’s talents and contributions. Although there are some things that they do FOR me, there are more things they do WITH me. We realise our little family haven’t changed that much as except that they are being responsible for some things which enables me to live my life happily, keep pursuing my hopes & dreams with the goal of taking care of myself and fulfilling my mission to educate others. Do not let dementia dominate your life. Never let dementia define you, or who you are. There are two things I want for you to take away from my presence here today. The first is for carers to become educated in being care partners instead of custodians. Life doesn’t end with a dementia diagnosis, but a different life just begins. It’s a life where you often have to make compromises. For examples, as a lifelong nurse who cared for others, it was hard for me to learn to be open about and ask for help. In spite of any compromises, your different life can be as vital and exciting as YOU choose to make it. Hi! I’m Rhys Dalton and I’m Maria’s son. I am 25 years old and will be getting married to my mom’s other “care partner,” Kayla Whitten, in November. My mum was diagnosed with young onset dementia while I was finishing up my senior year at the University of South Wales in Cardiff UK. As you might imagine, I wasn’t able to come home on the weekends too much, LOL….so I wasn’t really aware of the extent of the problems my Mum was being faced with. I got my degree in aircraft maintenance engineering and I was really looking forward to starting my career in that field as soon as I could after I got back to the states. I was 23 years old at the time and thought I had my life pretty well planned out. I was wrong. The past two years have been all about learning that life doesn’t always allow you to plan anything out. Kayla and I have spent a lot of time learning everything we can about Mum’s disease in general and about her needs in particular. People often talk about the “role reversal” that caregivers and loved ones go through, using phrases such as ‘my mum has become my child’ or ‘I have had to become the parent’. As we learned more about what mum WAS able to do, our picture of our roles as “Caregivers” changed dramatically. Now, some of this may be due to my mum’s character…she is VERY determined and believe me, once she sets her mind to something, it gets done.LOL. Well, she was determined that she WOULD get healthy, despite what her Drs had all told her & and to be positive, so she is EXACTLY that 2 years later, I never doubted her. It’s not that the diagnosis didn’t throw up for a loop that first year because trust me it REALLY did. There was, and still is, a lot of trial and error about how we live and handle everything from grocery shopping to paying the bills to going away for the weekend. But we have persevered & will perserver with the intention of maintaining a good, healthy, happy and loving relationship. We have not had the stereotypical experience, that most people expect and we do still feel like Marias son, daughter-in-law, and best friend. We have fought to keep our roles of parent and adult child separate from dementia, so that we can focus on our love and relationships, rather having them being defined only by dementia. We define ourselves as we always have, meaning Maria is still my mother and I am still her son, and Kayla is still her daughter in law or will be in days, but who’s counting!! Dementia entered our world, we didn’t not invite it. It was no one’s choice. Dementia has simply been the road we have had to go on, so we are dealing with it as positively as possible. One of the keys has been to not treat each other any differently- still act like her children and Maria still be our mother, and treat each other with love and respect. Though I have taken on many of the physical responsibilities my mother once was able to do, it has never felt like a ’caregiver thing’ – it is just who we are now. We act like roommates, and talk about everything, including dementia, in great depth. Kayla really treasures the time that she and mum are sharing together. Our relationships have become a lot stronger, and deeper, and in fact, because of dementia, we spend much more time together than we ever did before. One of the biggest influences on all our lives has been DAI. Life for Mum since joining DAI has been like the difference between night and day. It gives her structure, and enriches her life through intense and very special friendships. Through DAI, mum has been able to fulfill her goal of helping others by giving her a platform to talk to the newly diagnosed. Her responsibilities as a board member keep her sharp and focused. Peers have taken the place of her patients, and through the support groups, she is still helping so many other people. DAI has been crucial to understanding that life was not over and there is still much to be done in research and advocacy. DAI has not only been essential to mum, but to Kayla and me as we learn to be partners with my mum in giving her the freedom she needs to live a healthy and productive life. They have become family. That being said, we are all stubborn in our insistence that life is to be lived to the fullest and we are determined. Rhys: As Susan taught US all, Life is to be enjoyed as the gift it was meant to be…. What’s a Dark Fog or Black Cat got to do with Dementia? 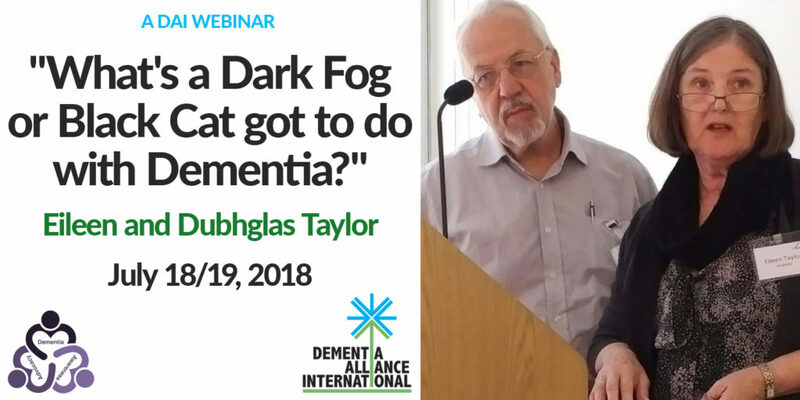 Please join us for our next “A Meeting of the Minds” monthly online Webinar “What’s a Dark Fog or Black Cat got to do with Dementia?” presented by DAI Secretary and her husband, Eileen and Dubhglas Taylor. DAI wishes to thank them for their willignness to share with us on this interestign and important topic. REMINDER: It is ONE EVENT, in numerous time zones. About the Webinar: Eileen Taylor, DAI Secretary shares her experience of what it is like to live with dementia in a unique way by showing how she has learned to externalizeher dementia by seeing it as separate uninvited entity such as a Dark Fog. 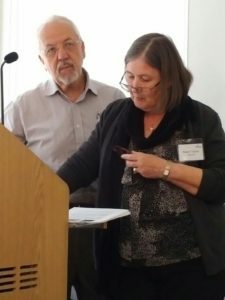 She and husband, Dubhg Taylor are interested in feedback by exploring this concept with people living with dementia to discover their opinions in a focus group. Externalizing is an effective communication tool for helping people living with dementia and their families to understanding the daily frustrations, challenges and victories in this journey. This presentation explores the benefits of seeing dementia as a separate entity by externalizing it and lessening the potential for interfering with relationship. Eileen and Dubhglas TaylorWhat's a Dark Fog or Black Cat got to do with Dementia?